An electrocardiogram, or ECG, is a recording of the heart’s electrical activity as a graph over a period of time. An ECG is used to measure the rate and regularity of heartbeats as well as the size and position of the chambers, the presence of damage to the heart, and the effects of drugs or devices used to regulate the heart, such as a pacemaker. The ECG device detects and amplifies the tiny electrical changes on the skin that are caused when the heart muscle depolarizes during each heartbeat, and then translates the electrical pulses of the heart into a graphic representation. A typical ECG tracing of the cardiac cycle (heartbeat) consists of a P wave (atrial depolarization ), a QRS complex (ventricular depolarization), and a T wave (ventricular repolarization). An additional wave, the U wave ( Purkinje repolarization), is often visible, but not always. The ST complex is usually elevated during a myocardial infarction. Atrial fibrillation occurs when the P wave is missing and represents irregular, rapid, and inefficient atrial contraction, but is generally not fatal on its own. Ventricular fibrillation occurs when all normal waves of an ECG are missing, represents rapid and irregular heartbeats, and will quickly cause sudden cardiac death. fibrillation: A condition in which parts of the ECG do not appear normally, representing irregular, rapid, disorganized, and inefficient contractions of the atria or ventricles. 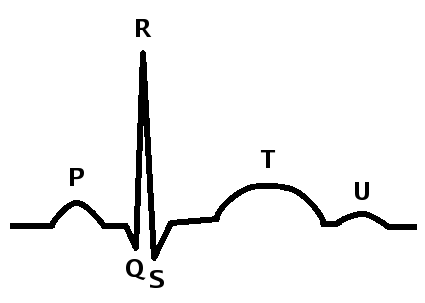 ST segment: The line between the QRS complex and the T wave, representing the time when the ventricles are depolarized before repolarization begins. An electrocardiogram (ECG or EKG) is a recording of the heart’s electrical activity as a graph over a period of time, as detected by electrodes attached to the outer surface of the skin and recorded by a device external to the body. The graph can show the heart’s rate and rhythm. It can also detect enlargement of the heart, decreased blood flow, or the presence of current or past heart attacks. ECGs are the primary clinical tool to measure electrical and mechanical performance of the heart. The ECG works by detecting and amplifying tiny electrical changes on the skin that occur during heart muscle depolarization. The output for the ECG forms a graph that shows several different waves, each corresponding to a different electrical and mechanical event within the heart. Changes in these waves are used to identify problems with the different phases of heart activity. ECG: Illustration of a patient undergoing a 12-lead ECG. Normal Systole ECG: The U wave is not visible in all ECGs. The first wave on an ECG is the P wave, indicating atrial depolarization in which the atria contract (atrial systole ). The P wave is the first wave on the ECG because the action potential for the heart is generated in the sinoatrial (SA) node, located on the atria, which sends action potentials directly through Bachmann’s bundle to depolarize the atrial muscle cells. Increased or decreased P waves can indicate problems with the potassium ion concentration in the body that will alter nerve activity. A missing P wave indicates atrial fibrillation, a cardiac arrhythmia in which the heart beats irregularly, preventing efficient ventricular diastole. This is generally not fatal on its own. The QRS complex refers to the combination of the Q, R, and S waves, and indicates ventricular depolarization and contraction (ventricular systole). The Q and S waves are downward waves while the R wave, an upward wave, is the most prominent feature of an ECG. The QRS complex represents action potentials moving from the AV node, through the bundle of His and left and right branches and Purkinje fibers into the ventricular muscle tissue. Abnormalities in the QRS complex may indicate cardiac hypertrophy or myocardial infarctions. Animation of a Normal ECG Wave: The red lines represent the movement of the electrical signal through the heart. The T Wave indicates ventricular repolarization, in which the ventricles relax following depolarization and contraction. The ST segment refers to the gap (flat or slightly upcurved line) between the S wave and the T wave, and represents the time between ventricular depolarization and repolarization. An elevated ST segment is the classic indicator for myocardial infarctions, though missing or downward sloping sloping ST segments may indicate myocardial ischemia. Following the T wave is the U wave, which represents repolarization of the Purkinje fibers. It is not always visible on an ECG because it is a very small wave in comparison to the others. When ECG output shows no identifiable P waves, QRS complexes, or T waves, it imdicates ventricular fibrillation, a severe arrhythmia. During ventricular fibrillation, the heart beats extremely fast and irregularly and can no longer pump blood, acting as a mass of quivering, disorganized muscle movements. Ventricular fibrillation will cause sudden cardiac death within minutes unless electrical resuscitation (with an AED) is performed immediately. It generally occurs with myocardial infarcations and heart failure, and is thought to be caused by action potentials that re-enter the AV nodes from the muscle tissue and induce rapid, irregular, weak contractions of the heart that fail to pump blood.